Discover Marina del Rey will be combined with the popular MarinaFest event, which will include a mix of information booths, family-fun, boat show, childrens activities, historic harbor tours, and much more! More information coming soon. A yearly event since 1974, this annual contest has become the largest fishing tournament in Southern California. Its also the last 100% non-profit tournament on the west coast. The event has attracted almost a thousand participants and over 300 boats every year and entrants have come from as far as Northern California, Arizona and Nevada. Prizes are awarded for catching the biggest fish with rod and reel and fishing starts at sunrise. It is scheduled annually in June on varying specific dates depending on the health of the species. Watch the public weigh-ins Saturday in Burton W. Chace Park at 5 p.m. and on Sunday at 3 p.m. Visit marinadelreyhalibutderby.com or mdranglers.com for more information or call 310-827-4855. Since the mid-nineties, the Department of Beaches & Harbors has been honored to produce the Marina del Rey Fourth of July Fireworks Show! The fireworks are shot from a barge in the Marina's main channel for a spectacular display reflected in the harbor. Burton W. Chace Park and Fisherman's Village are popular viewing spots, but any water view seat is a good one! Fireworks will start at 9 p.m, but many spectators visit Marina del Rey much earlier to enjoy the day at the park and to secure parking, which becomes limited. For parking and other information, please call 310-305-9545 or visit marinadelrey.lacounty.gov. A unique, free event, Old Fashion Day in the Park at Burton W. Chace Park features vintage yachts, and antique and classic cars and motorcycles. Watch ship models and modelers do their work or take a free ride in the harbor aboard a steam engine yacht. 10 a.m. to 3 p.m. The Old Fashion Day in the Park is typically held the third or final week of July. Call 310-305-9545 for any updates or go to VisitMarinadelRey.com for more information. 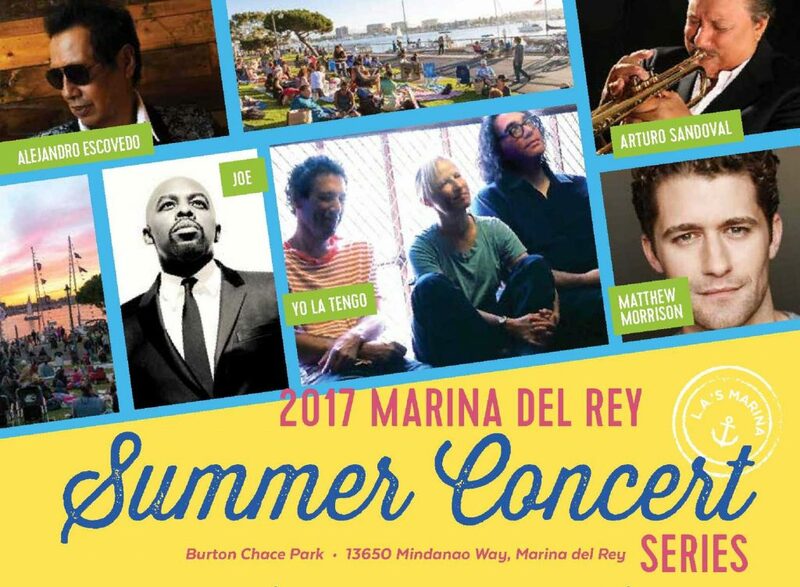 This popular series of free 90 minute outdoor concerts is held each summer in one of the most spectacular waterfront settings in Los Angeles, Burton Chace Park. Thursday evening symphonic concerts feature world class artists appearing with the Marina del Rey Symphony, conducted by its Musical Director Frank Fetta. On alternate Saturdays, the concerts bring to the Marina stellar artists from the worlds of pop and jazz. All of the Summer Concerts in the Park are FREE TO THE PUBLIC. Seating is available on a first come, first served basis for each of the concerts. All concerts start promptly at 7:00 pm, so be sure to arrive at the Park much earlier to ensure you get seating prior to the start of each concert. There is a CHARGE FOR PARKING at the official parking facilities located on Mindanao on the way towards the entrance to Burton W. Chase Park. County Parking Lots #4, #5, and #77 are available for Concert in the Park parking and the parking fee is typically $8 to $10 during the Summer (CASH ONLY on concert dates) but varies depending on the date and time and is posted at the entrance to each of the three lots. There is also a FREE BEACH SHUTTLE on Concert in the Park nights, and for more information on the schedules and locations for the Beach Shuttle, go to MarinadelRey.LACounty.gov. This years Discover Marina del Rey event, originally scheduled for Sunday, October 8, 2017 at Burton Chace Park, has been rescheduled to a later date in May 2018. Usually held the first Saturday evening in December. Festively decorated boats illuminate the main channel in one of the Marina's most visually exciting events. A preview Boat Parade takes place the Friday evening before the main event. Saturdays main parade is preceded by a short fireworks display in the Main Channel at 5:55 p.m. The best viewing of the parade is at Burton Chace Park and Fisherman's Village. Call 310-670-7130 or visit mdrboatparade.org for details. Traditionally held on New Year's Eve, the Fireworks Display by the Water is always a spectacular event to bring in the New Year at this spectacular setting. Meet on third Sunday of every month at Burton Chace Park, at the West end of Mindanao Way, Marina Del Rey. Drop in any time between 10:30 a.m. and 12:00 p.m., then join us on a short but fun ride on the beach bike path to Hermosa Beach for lunch and lively discussions about the past, present, and future of recumbency. For more information, contact Gerry Pease, gerbar92@msn.com, 310-379-6663. For more visitor information, including recommendations specific to your situation, contact the Marina del Rey Convention & Visitors Bureau at 310-305-9545. For group information and travel trade, call 310-306-9900. More information is also available on line at VisitMarinadelRey.com or via email at info@VisitMarinadelRey.com, or stop by the Marina del Rey Visitor Information Center, 4701 Admiralty Way, Marina del Rey, CA 90292. There is very limited METERED PARKING on the entry grounds of Burton W. Chace Park which has a maximum LIMIT TIME OF 90 MINUTES and costs 25 cents for each 10 minutes. There are three large LA County parking lots on Mindanao Way towards the entrance to Burton W. Chace Park and all of those lots provide parking for a FLAT FEE AS POSTED with no daily time limit These official parking facilities are marked as LA County Parking Lots #4, #5, and #77. Each of those three lots has an attendance and charges the same daily FEE AS POSTED. The parking fee is typically $8 to $10 (cash only on concert dates) and varies based on the day and time and is clearly posted at the entrance to each of the three lots. There is also a FREE BEACH SHUTTLE on Concert in the Park nights, and for more information on the schedules and locations for the Beach Shuttle, go to marinadelrey.lacounty.gov.